Is léiritheoir ceoil agus pearsa teilifíse é Simon Phillip Cowell a rugadh ar 7 Deireadh Fómhair, 1959. Ba bhreitheamh é ar an gclár teilifíse The X-Factor a chuir sé tús leis sa bhliain 2004. Tá cónaí air in Beverly Hills, California, faoi láthair. Tá clú air as an mbealach borb a gcuireann sé locht ar na hiomaitheoirí ar The X-Factor. Rugadh Cowell in Lambeth, i Londain Shasana agus tógadh é in Elstree, Hertfordshire. Bhíodh a mháthair, Julie Brett (née Josie Dalglish), ina damhsóir bailé, agus feidhmeannach i dtionscal an cheoil ab ea a athair, Eric Selig Phillip Cowell, Sr. (1918–1999). Bhí lámh aige seo le forbairt gníomhaireachtaí eastáit chomh maith. Ba de shliocht Sasanach a mháthair agus de shliocht Polannach a athair. Críostaithe iad muintir a mháthar agus ba Ghiúdaigh iad formhór a shinsear Pholannach, cé nár labhair athair Simon lena chlann faoi ariamh. 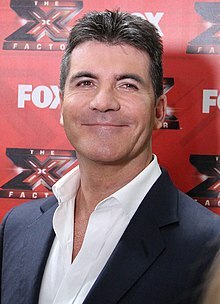 Tá deatháir níos óige ag Simon Cowell, chomh maith le triúr leasdeartháireacha agus leasdeirfiúr amháin. D'fhreastail Cowell agus a dheartháir ar Radlett Preparatory School agus ar Dover College, scoil neamhspleách. D'imigh sé i ndiaidh na scrúdaithe leibhéil O a dhéanamh. Rinne sé staidéar ar an mBéarla agus ar an litríocht agus bhain sé GCE amach in socheolaíocht. Bhain sé GCE eile in socheolaíocht in Windsor Technical College. In aois a sheacht mbliana déag bhí sé ag siúl amach le Paula Hamilton, mainicín. Ghlac Cowell roinnt post ag scamhadh geatairí do dhaoine—mar theachtaire le linn déanamh an scannáin úd de chuid Stanley Kubrick, The Shining, mar shampla—ach níor réitigh sé go maith lena chuid comhghleacaithe agus maor. Sa deireadh d'éirigh lena athair post a fháil dó i seomra an phoist ag EMI Music Publishing, mar a raibh a athair ina fheidhmeannach ag an am. Tugadh an leathanach seo cothrom le dáta an 31 Lúnasa 2017 ag 13:16.